Last, year our combined mudroom/laundry room space got a little makeover thanks to a board and batten wall treatment and some hooks. These simple updates alone made the space a lot more functional for the mudroom side of things. Unfortunately, the laundry side did not majorly benefit and has not been functioning as well as it could be. The first issue has been the floor. While the floor obviously doesn’t make much of a difference in terms of helping me with laundry, the old, stained linoleum makes me never want to do laundry because I feel like I need to wash the floor in there every single day. The thing is, no amount of scrubbing makes a difference. It’s just REALLY old. The second issue is the lack of a workspace. A counter would mean I can easily fold towels and clothes as soon as they come out of the dryer and not have to dump them in a laundry bin and cart them off to the kitchen table. Also, the lack of counter somehow makes the top of the washer and dryer instant drop zones for everything. This is going to be a tw0-weekend kinda makeover and completely DIY friendly. The last piece of furniture for the big office makeover arrived today after being on backorder for more than a month. I’m hoping to take photos and have the full reveal for you next week! 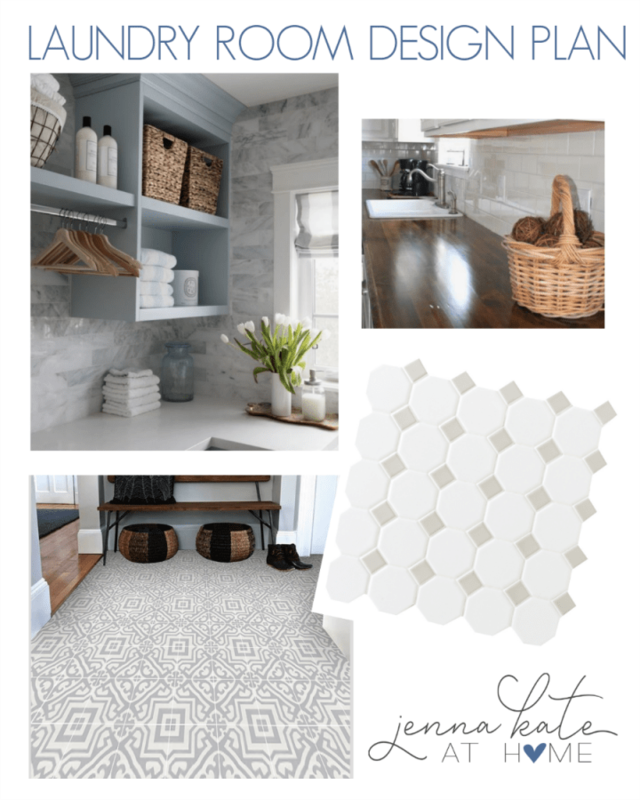 And since that’s just about complete, I’ll be starting on this laundry room makeover asap! The new floor has already arrived, so I’ll be back early next week to share all of the details about that. In the meantime, make sure you’re following me on Instagram to get lots of sneak peaks!